The bustling city of La Fortuna de San Carlos, in the province of Alajuela, is located 28 miles away from the northeast of Ciudad Quesada (San Carlos). 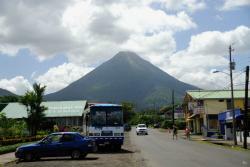 It is located at the feet of the Arenal Volcano. In the last years, the city has become one of the main tourist centers of Costa Rica due to the incredible views to the volcano from the hotels in the city’s downtown and, also, to the incredible spas that are located in the vicinity. If you are lucky enough, you will have the chance to observe some lesser volcano activity, like smoke and burning stones that fall from its hillsides at night. La Fortuna offers both nature and adventure: the city’s tourist companies organize diverse activities, such as hiking, tours to the Arenal Volcano, horseback riding, zip-lines, kayaking, sport fishing, etc. One of the most famous and visited nearby spas is Tabacon, but there are many other spas worthwhile visiting. Apart from everything related to the volcano, the city has in its proximities a beautiful waterfall, very appreciated both by tourists and local inhabitants: the Rio Fortuna Waterfall. 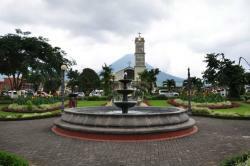 Do not hesitate to come and visit this charming city, located at the feet of an impressive volcano that guards the city and dominates the whole landscape. And do not worry, the volcano is being monitored for years and, nowadays, the volcanic activity is of minor importance.